Stanley Baker stars and produces and Peter Yates directs the 1967 ROBBERY, a gripping, true-life inspired crime thriller that has been given a glorious makeover on an impressively featured new Blu-ray from Network. Slarek salutes the film and an excellent disc. Note that the review of the film below has been reproduced and updated from our coverage of the previous Network DVD release of Robbery, but the sound and vision, extra features and summary are all specific to this release. It seems a little absurd that a film could be criticised for the excellence of its opening scene, but such is the fate that has befallen the 1967 British crime thriller Robbery in some quarters. And it really is a cracking start, one that was to transport director Peter Yates to Hollywood a year later at the specific request of a certain Steve McQueen, who was impressed enough with Yates' handling of this sequence to want him at the helm of his latest project, Bullitt and what was to become the most famous car chase in movie history. Robbery begins with the successful execution of a risky but cleverly devised plan to steal diamonds from their appointed guardian. Unfortunately for the robbers, they are spotted changing vehicles and the police are soon on their tail. What follows could well be the most thrillingly filmed car chase in British cinema history, a brilliantly shot and edited hurtle through London streets that really is edge-of-seat stuff. Even the minor plausibility lapses (it's unlikely the two gang members who jump from the vehicle would have escaped serious injury at that speed) are so well handled that they fail to dent the overriding realism of the sequence. There are also a couple of moments here – the extraordinary in-car shot in which a beat policeman smashes the windscreen of the vehicle as it passes and the driver has to punch out the glass to see where he is going – that even 40 years on remain unique to this film. So how could anyone complain about such an opening (well, except the original writer – see the extra features)? Well it's not the sequence itself that appears to have irked the critical, but that it's a one-off. A common trait of modern action movies aimed at a short-attention-span audience is for the opening scene to function almost as a trailer for business to come, a promise that if you sit still for the required plot and character setting scenes, then there'll be more of the same later, only next time it'll be even louder and faster and longer. Robbery doesn't do that. Here the scene serves its purpose and once it's over does not need repeating. To some modern action fans this plays as something of a cinematic prick-tease. 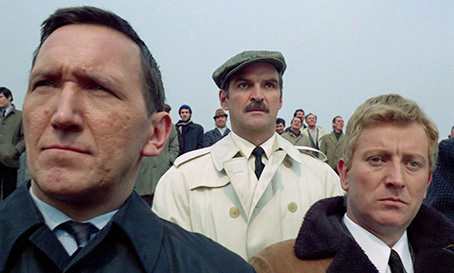 So know in advance that it's the only such sequence and enjoy the rest for what it is, an atmospheric, realistic and meticulously detailed caper movie that bears more than a passing resemblance to one of the most famous of all real world UK crimes. The film documents the planning, preparation and execution of the robbery of the Glasgow to London night mail train, a job that is funded by the opening diamond haul and is expected to net up to three million pounds. It's been organised by fresh-from-jail criminal gang leader Paul Clifton (a typically but most appropriately hard-nosed Stanley Baker), the plan itself having come from the still banged-up Robinson (an almost unrecognisable behind-the-glasses Frank Finlay). The scale of the job leads to a number of complications, the manpower required to successfully pull it off forcing Clifton to strike a deal with two other criminal firms, who bring conditions that deviate from his careful planning, and Robinson's specialist knowledge requires that he be boosted from jail. One of the film's real strengths is that problems are dealt with as they arise and in a professional manner, with compromise always tempered by a degree of good sense. Clifton's gang (themselves a collection of familiar faces from the period, including Barry Foster and William Marlowe) are a loyal and tight-knit crew who all know their jobs, and it's only through the involvement of outsiders that the inevitable weak links emerge, plot turns whose air of slight disappointment come partly from their overuse in the years that followed. Hot on their tail, meanwhile, is inspector George Langdon (James Booth), a patient and methodical detective who appears to work as much on intuition as he does on the facts of the case and his almost intimate knowledge of the criminals on his patch. 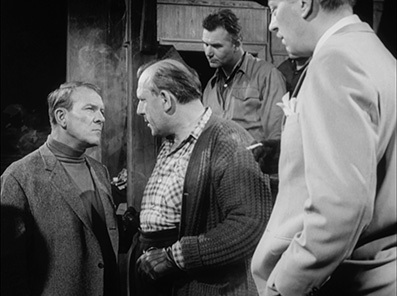 The pleasure, as with any good caper movie, comes from the details of the plan's preparation and execution, a process that is almost never sidelined by personal issues – only Clifton's home life is briefly shown and even then it's to establish his personal motivation and to set up a key post-robbery scene. Although both the crime and its investigation are given enough screen time for the audience to be interested in both parties, Yates aligns us from the start with Clifton and his boys (no easy feat given that they recklessly barrel through a party of schoolchildren during the opening getaway), to the extent that their post-robbery near discovery by an army helicopter is almost nail-bitingly tense, filmed as it is almost entirely from their viewpoint and with the hovering helicopter taking on the coldly predatory aura of a War of the Worlds alien ship. The inspiration for the story, of course, is the 1963 Great Train Robbery. Although the film plays some speculative games with the build-up and goes its own way when it comes to tracking the villains down, the robbery itself is slavishly faithful to its inspiration, right down to the gang's decision not to use guns, the sabotaging of signals to bring the train to a halt, and the hiccup caused when the man hired by the gang to drive the train found himself unfamiliar with the controls of this particular locomotive. 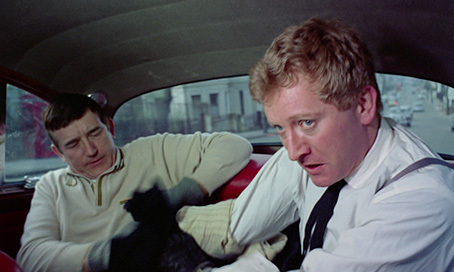 The car chase may be Robbery's most celebrated scene, but its enduring appeal comes as much from its sober approach, its low key performances and its attention to detail and character as this attention-grabbing opening. This combination of elements, and the fact that it tells a rattling good story, has ensured that it has not dated in the manner of many of the British crime films and TV series that followed, where mouthy, argumentative villains and cops were to later become the object of cliché and ripe for parody. Like the robbery itself, this is a slick, well planned and professionally executed job. When I reviewed the previous Network DVD release of Robbery back in 2008, I expressed the belief that the 1.33:1 aspect ratio of the transfer on that disc was not the correct one, and suggested that 1.66:1 was the more likely framing. In other respects I thought the transfer was first class. I may have to redefine what I mean by that term after seeing the 1080p transfer on this new Blu-ray, which absolutely wipes the floor with the previous DVD in every respect. For a start the original 1.66:1 aspect ratio has been restored, which when compared side-by-side with the one on the previous DVD transfer shows slightly less of the image at the top and bottom of frame, but noticeably more at both sides, which removes the uncomfortable tightness of framing that was evident on some shots (see below). And it looks absolutely lovely. This is a handsomely restored and graded transfer, with a succulent level of detail, a more forgiving contrast range and more naturalistic colour than on the previous DVD, whilst retaining that transfer's inky black levels. The opening scene wide shots of London streets are particularly ravishing and look almost as if they could have been filmed yesterday. The film grain is very fine, but I couldn't spot any obvious tell-tale signs of DNR or image enhancement. The linear PCM 2.0 mono track is also in good shape. The slight range restrictions are inevitable for a film of this age, but the dialogue and especially the sound effects are clear and distortion-free, and there is no trace of background hiss or damage. Producer Michael Deeley (whose enviable CV includes the likes of The Italian Job, The Man Who Fell to Earth, The Deer Hunter and Blade Runner) recalls his early days as a producer, his desire to make a film based on the Great Train Robbery, how easily things moved forward on the project once Stanley Baker came on board as co-producer, and their decision to fictionalise elements of the story to avoid getting slapped with law suits by the real life robbers. Baker was also instrumental in getting them police permission to stage the opening car chase through the streets of London, and there's an amusing anecdote about what happened when some hard men from Leicester turned up and informed Baker that the production needed their personal protection. Details are also provided of an end-of-film coda shot in America with Jason Robards that was ultimately abandoned because it was, Deeley's own word, "risible." His story of how he got his first film industry job will likely make struggling film students weep. An utterly enthralling 1972 interview with Stanley Baker from the TV series Cinema, who responds to questions from an unseen Clive James on a number of films from his illustrious career, not all of which are immediately identified (were clips included in the original transmission?). A great deal of ground is covered, although the running time tends to restrict Baker to one story or anecdote per film, but all are worth hearing. He talks about working with Harold Pinter and Joseph Losey on Accident, with Ursula Andress on Perfect Friday, and with Laurence Olivier on Richard III amongst others, and reveals how he first got his first film part as a child and how he pushed hard for the role of Bennett in The Cruel Sea. Robbery is touched on, as are his reasons for becoming a producer as well as an actor, and he is passionate in his enthusiasm when he reflects on how wonderful it is for an actor when the dialogue is up to scratch. Clapperboards are included and there are several takes of one question, which suggests we may be watching the raw footage rather than the programme itself (there are no front or end titles or credits), but that may have been part of the show's aesthetic. Short and in scratchy monochrome it may be, but this peek at Peter Yates and his cast and crew shooting part of the train robbery sequence is still a most valuable and welcome thing. A loosely assembled look back at the making of Robbery comprised entirely of new interviews with some of those involved, both in front of and behind the camera. Original screenwriter Gerald Wilson outlines how he came to the project and how his script was re-written by others, and bemoans how his original plan for the opening robbery was transformed into what he describes as "a totally clichéd car chase." Art director Michael Seymour reveals that they had no help from British Rail and that he didn't have a good relationship with one of the producers, specifically "the actor." Supporting player Michael McStay has a number of entertaining anecdotes, praises the way Yates works with his actors, claims that just about everyone had a run-in with Stanley Baker at one point, and that the film seemed to have more problems than most. Follow actor Glyn Edwards remembers one of the policemen recruited as extras having a quiet word with him about his road tax, and getting paid twice for one scene when the first shoot was cancelled. 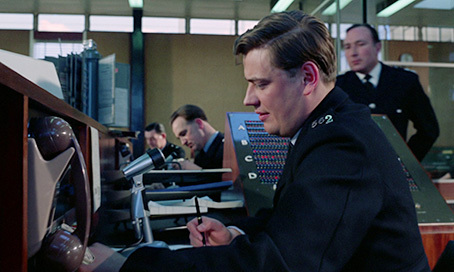 Production manager Gavrik Losey describes the car chase as "phenomenal" and also salutes Peter Yates as an actor's director, a sentiment echoed by actor Barry Stanton. Really good stuff. With only the title to go on when I first selected this particular extra, I wasn't quite sure what to expect, so got a bit of a surprise when a running time of an hour and 36 minutes came up on my disc player's display. The 4:3 framing and monochrome image made me suspect at first that Network had uncovered a rarely seen film from the 1940s, but considering that the Great Train Robbery took place in 1963 and that this film was beginning to look very much like a film recreation of that crime, its planning and its subsequent investigation, that dates just didn't match. And the sound looked seriously out of sync with the picture. So what do we have here? The Great Train Robbery is actually a German TV mini-series made in 1966 whose original title was Die Gentlemen bitten zur Kasse, which Wikipedia translates as The Gentlemen Prefer Payment (my German is terrible, so I'm not about to challenge this). 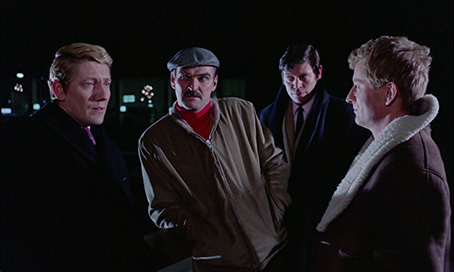 It became more widely known in in English speaking countries as The Great British Train Robbery, but had a UK cinema release under the title it has here. 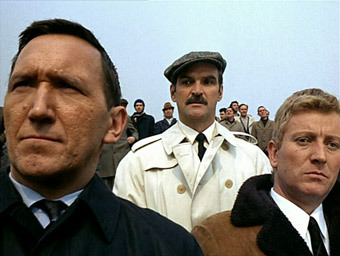 As I intimated above, the film is a recreation of the robbery, its build-up and the police investigation that followed, one that fictionalises details – names and places have been changed and much of the dialogue remains the subject of speculation – but in other respects is surprisingly faithful to the then known facts. What's impressive about the film is that it sidesteps sensationalism at every turn, taking a matter-of-fact approach to events and characters, with the first half focus on the robbery giving way to a second half in which the police investigation into the crime takes centre stage. The version here is not the German original but an English language dub, and while the mismatch of words and mouth movements is obvious from an early stage, the voice work is generally on the nose. Indeed, it would be great to know who was behind the English dub here, as a couple of the voices sound awfully familiar, though not quite enough for me to recall any names. It's worth noting that the original negative was apparently destroyed in the mid-80s when national broadcaster Norddeutscher Rundfunk cleared out its vaults, so the transfer here has been sourced what we can presume are the best available print. For the most part the results are pretty damned good, with a very decent contrast range, excellent black levels and a sharpness that, while not equal to that of the main feature, is still better than I would have expected. Small sections of the print, however, have suffered the sort of explosive damage that could have easily made its way into Bill Morrison's Decasia. For an example of how good the image can look, check the frame grab above, then take a peek at the one below to see what occasionally hits the transfer. The soundtrack is a very different story. While the original German soundtrack is likely still in reasonable shape, the English dub sounds as if it was dropped into a bath of acid and then trampled on by jack-booted elephants to dry it out. The crackle is ever-present, is often distractingly loud and occasionally threatens to overwhelm the frequently fluffy dialogue, but I'm guessing that this is down to the rarity of this track, which has clearly not been treated with the loving care it probably deserves in the many years since it was first heard. 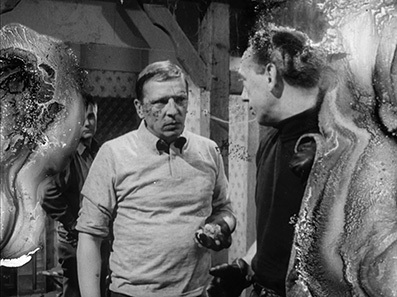 You do get used to it – you'll have to if you're going to stay with the film – though occasionally it becomes impossible to ignore, notably in the sequence illustrated by the frame grab above, where the rhythmic appearance of visual damage is accompanied by what sounds like white noise explosions, giving the impression that the film is under sustained grenade attack. I still absolutely applaud this inclusion, a rare chance to see an alternative take on the story told in Robbery, and one that was first screened a full year and a half before Yates' film hit the London cinemas. Rounding things off is a Gallery of promotional material for the film, including posters, still and pages from the press book. The promised Commemorative Booklet was not available for review, but should be included with the release disc. A still gripping crime thriller with a belter of an opening scene, a first-rate cast and an impressively sober and intelligent approach to its drama. Even if you have the previous Network DVD, this new Blu-ray is an absolute must-have – the transfer is lovely and the extra features are are beyond anything I was expecting. Highly recommended.